This was a photo I’ve had in mind for a long time, but for some reason kept putting off until one morning this summer when I finally decided to go for it. It involves something called a Bokeh Wall, which is basically a homemade solution for creating cool sparkly out-of-focus backgrounds like what you see here. All you need (so I’d heard) is a vertical surface and something you can attach to it that reflects light. Even though everything I had seen seemed to indicate that homemade bokeh walls like this were quick and inexpensive I always figured it would involve a lot more planning and preparation than it actually did. I’m going to be honest here: the picture you see above took exactly ten minutes to capture, involved almost no pre-planning, and was an entirely spur-of-the-moment activity that my son and I did before I left for work one rainy morning a few weeks ago. I shot this at f/1.8 to get some really cool bokeh going on in the background, but as usual I kind of wish I had stopped my lens down a bit because the depth of field is just a bit too shallow for my liking. And while I could go back and re-do the photo (and probably will), I wanted to post my initial shot here even though it’s less than ideal because I was so excited about taking it. The dual-toned background is a result of two light sources: a window which is just to the left of my camera, and an overhead chandelier. Light coming in from the window is more white whereas the incandescent bulbs on the chandelier were yellow, which not only led to the multicolored background but helped light the toy train in a bit more interesting manner as well. Incidentally I also used the self-timer on my camera to eliminate any possible vibration from my finger pressing the shutter, and also shot at ISO 100 to get the highest-quality noise-free image possible, and given that my camera and my subject were stationary the resulting low shutter speed of 1/20 was not really an issue. It looks great! I love the bokeh and ALSO the reflection from the table for added interest! I’ve never used crumpled aluminum foil but will give it a try. I’ve used a small, battery powered 6foot long string of LEG Christmas colored lights, and also a similar string of white lights in setting up a bokeh shot. Those work great too, but have to be a little distance from the subject to really turn out well. I have grown to LOVE my 50mm! I enjoy following your Nifty fifty! Good work! Oh, I like that idea of using a string of LED Christmas Lights. Thanks for the idea, Marsha :) Glad you’re enjoying that 50mm lens! I really like the effect! Reminded me that I would like to try something like this! So nice that it doesn’t take too much planning and setup. Thanks! You’re right about the planning and setup, Lisa. It was literally by-the-seat-of-our-pants, last-minute, and involved almost no planning at all. If you do try something like this, let me know how it goes! Wow! I like how everything blends so well. The reflective wood table (and lighting) creates a neat illusion. There is almost no horizon to this photo so the train could be floating except for the reflection of the train which is equally cool. The color pallete is also blendy. Thanks David! I would have never thought to try something like this on my own, but was pleasantly surprised at how easy it was. If you give it a shot, let me know how it turns out! The glossy finish on your table didn’t hurt either. Great tutorial. My favorite source of bokeh is the morning sun behind my neighbors pear tree. 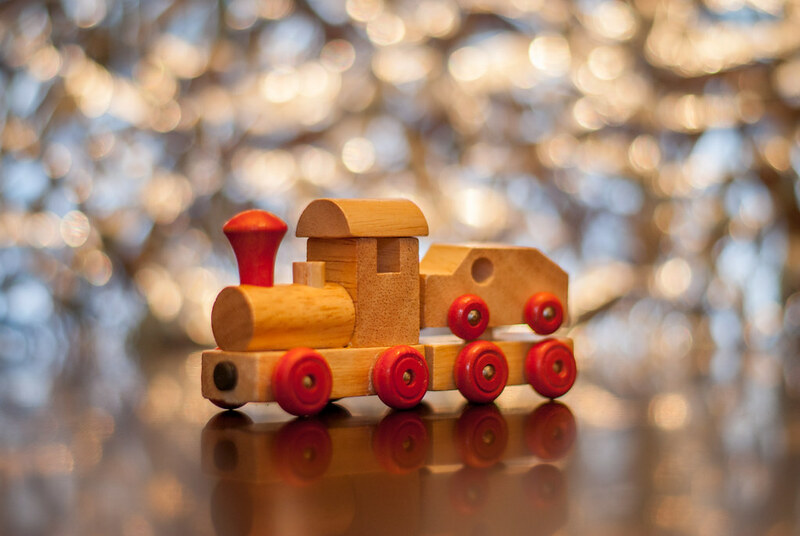 Have you tried making bokeh shapes? I used star shapes for my Christmas cards. My Christmas tree provided the lighting. I’m glad to have you as a reader of Weekly Fifty! I thoroughly enjoy your Weekly fifty! I am getting very fond of using my nifty fifty. I never go out without it. I even lent it to aspiring (and brilliant) young photographers…but I think I will stop that. Your precious cargo set is very original and seems pretty easy to use. I will try with my son’s cars and let you know. I realise that I tend to be more creative on shoot than at home…but I will definitely keep my creativity in and out of the house. Aluminium foil?? Who would have thought about it??? Well…you Simon! 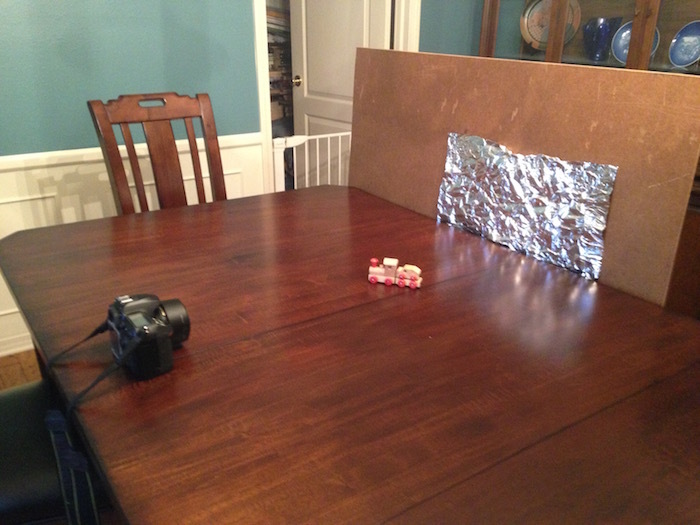 Bonjour Muriel, and thank you for your kind words :) I’m glad you enjoyed this week’s post, and if you take anything with a similar aluminum foil backdrop I would love to see the results. Keep using that Nifty Fifty, and thanks for following my blog from Kinshasa! Thank you…. always wondered how this could be done..
Glad you found this post to be helpful, Paul!